Ex-pat Brit Steve Read currently races in Top Fuel Dragster in Australia. He attended the 2005 FIA European Finals at Santa Pod as a VIP for the first time in thirteen years since emigrating. Born in Wallingford on Thames, Steve lived in Australia for three years from the age of nineteen before returning to work with his father Jim Read, who ran the Le Patron Top Methanol Dragster and was a leading light in the administration of the BDRA in the 1980s. Racing in Europe from 1987-92, Steve won the UK Championship six times and the European Championship five times in the Readspeed Top Methanol Dragster; he was also the first racer outside the US to run a five second pass in a methanol-fuelled car, in July 1992 at Avon Park. He emigrated to Australia in 1993. Eurodragster.com: What do you do away from racing? Steve Read: I run my own transport firm in Australia which supplies Road Trains that travel across Australia. Eurodragster.com: Which team do you race for and do you own the car? Steve Read: I am a paid driver for the Rapisarda Top Fuel Team. When I emigrated to Australia I took the Alcohol car there and won two championships in 1993 and 1994. I was then approached by Santo Rapisarda, a Sicilian who has been in Australia for 40 years and owns the biggest mobile crane company in Sydney. 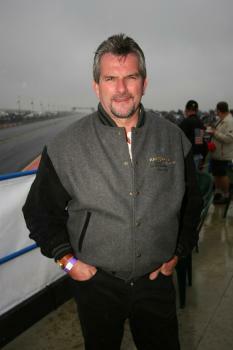 I started racing in Top Fuel in late 1994 and have been with Rapisarda since then. I won back-to-back championships in 2001 and 2002 with the Fuel Car, was second in the championship seven times and fourth once. Eurodragster.com: Have you raced every year in Australia since you emigrated? Steve Read: I took one year out (2003) following the birth of my first daughter. Sometimes you spend too long in the racing world and need to take some time off to refresh yourself. Eurodragster.com: Have you raced in America? Steve Read: Just before I emigrated, I entered the methanol car in the 1992 Winston Finals and lost the final by seven thousandths of a second - if I had won I would have been the first European to win an NHRA National Event. Eurodragster.com: How many Top Fuel cars are based in Australia? Steve Read: There are about eighteen cars in the whole of Australia. However, most cars race on a local rather than national basis because of the distances involved, but we have no trouble in filling an eight car field. Eurodragster.com: How has the Top Fuel scene changed in Australia over the time you have been there? Steve Read: Top Fuel in Australia went through major doldrums in after 1996-7 when a number of tracks were closed. The first to close was Eastern Creek, and then in 1998 Melbourne and Adelaide closed for championship racing. So between 1998 and 2003 the Championship was operating with two tracks only, Willowbank and Perth, 4,800 kilometres apart. The big turnaround for Australian racing has been the opening of the Western Sydney International Dragway in 2004. A group of racers in Sydney led by Jim Read campaigned to create a new raceway by doing a deal with the owners of the adjacent Eastern Creek site (now a road circuit) and acquire land for WSID. The key moment was when the local government organised a meeting to assess the viability of investing into the new facility. Instead of a few dozen racers and other interested parties turning up to the meeting, we had about 1300 people turn out for the meeting. As a result the local Kwinana Government backed the new development to a considerable extent, which has enabled it to become a purpose built, world class facility. The entire racing community helped the campaign to develop WSID and there were events such as processions around Sydney to raise public interest for the new facility. As a result of the success of WSID, other states have shown interest in investing in new drag racing facilities. The Canberra government have agreed to put AUS$10m into a new strip there and in Darwin, the authorities are also looking to invest. Eurodragster.com: Why was government funding forthcoming? Steve Read: Apart from the effectiveness of our campaign, drag racing is the number one motor sport for both competitor and spectator numbers in Australia. WSID has stadium seating for 30,000 spectators and there were 700 competitors at the first race. Eurodragster.com: How does the scene in Europe compare to that in Australia? Steve Read: The racing scene in Europe is similar to Australia, with a similar level of development. The championship is well established, although the weather in Australia is less of a threat to completion of events and there are more events in our championship, seven rounds in 2004-5. There are some top quality cars in Europe. However we are fortunate in Australia to have government support for the development of the facilities. Eurodragster.com: Do you have any plans to come back to race in Europe? Steve Read: As I am here for the first time in almost fifteen years I am trying to put a deal together to race in Europe as well as Australia as there is little overlap between their two sporting calendars and I'd like to race in Europe again. I've talked to a few people but have yet to reach a decision, however it would be great to race again against some of my old adversaries like Micke Kågered. Eurodragster.com: What is your opinion on the increase in the interest in Drag Racing globally? Steve Read: I am very impressed with the European Championship and there is always great international co-operation between drag racers. For instance, Scott Kalitta will be coming to Australia to race his 2004 car, which the Rapisarda team will be acquiring at the end of his visit. If anyone can expand Drag Racing to more countries successfully, Keith Bartlett can - he has all the right qualities and enthusiasm. A global series was mooted a number of years ago. While I don't think the time was right for that back then, I do believe we are now reaching the stage when this could be considered as the next big step in the sport's development. Eurodragster.com: What are your personal bests? Steve Read: My personal best is 4.735 at 299 mph. Eurodragster.com: What is your next race in Australia and how can we in Europe follow your progress? Steve Read: My next race is the season-opening AC Delco East Coast Nationals on 16th-18th September at the Western Sydney International Dragway. You can follow the action by going to www.dragster.com.au. Eurodragster.com: It's great to see you here again at Santa Pod, Steve, and we all look forward to seeing you in a Top Fuel car in Europe in the near future.